Servicing Oak Park Victoria and surrounding suburbs Melbourne. If you’re locked out of home after hours, dont stress. Give Mick from Human Key a call. One look at our reviews and you’ll see, Human Key value our customers, and beleive that customer service is paramount. We’ve been doing this a long time. If you need advice or a quote, give us a call. We can help. Mick was reliable, professional and provided exceptional customer service. Highly recommended. Exceptional amd trustworthy service. Arrived earlier than expected which was great and professionally completed the 3 lock re-keying jobs extremely quick and for a price I was very happy with. Will without-doubt recommend Human Key to everyone I know. Thanks mate ? I can recommend Mick with confidence. Just a good guy with a good attitude and great work ethic. You gotta trust your locksmith and he is 100% trustworthy. Anyone looking for an honest nice locksmith, he is the number 1 choice. Cannot recommend highly enough. Loves his work, and does it promptly, efficiently and with a smile. Hard to find tradies like this. I definitely struck it lucky when I engaged Mick for a work request. After dealing with so many terrible tradies, it was refreshing to be provided with sensational service. Mick couldn't be more honest, efficient, friendly, professional and excellent at his job. I highly recommend him. 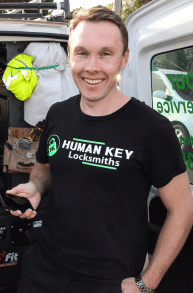 He should be your first point of contact for anything locksmith related. Request A Callback From Michael!